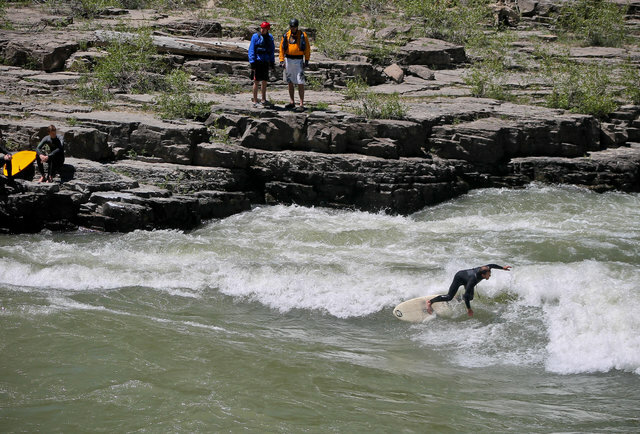 Lunch Counter is one of the marquee river surfing waves in the United States. Though modern whitewater parks have a lot going for them, it’s hard to beat a beautiful wave in a beautiful canyon. You’re looking for relatively high flows on the Snake; ideal flows are going to be between 9,000 and 12,000-13,500 (it’ll wash out too high), though you’ll still get good surf around 6,500. Higher flows generally make for a wider, flatter wave, and lower flows tend to make for a narrower, steeper wave. Generally, we’re taking spring peak into sometime in early summer. You’re going to start on the far side of the river, so it’s worth trying to catch the wave on the fly. But after that, you’ll be catching the wave from river right, jumping out onto a seam that will carry you onto the face of the wave, if everything goes well. When you’re blown off the wave (or miss it on your ferry across), swim hard through the rapid and keep your wits about you. Also keep an eye out for rafters; boats heading downstream have the right of way, and though sometimes the wave will be wide enough to let a raft past, sometimes boat captains are also jerks. The gauge for the Snake River near Alpine gives you an accurate flow. Look for something between 9,000 and 13,500 for prime flows, though it’ll be worth surfing down to 6,500 or so. Too high and it’ll start to wash out. Park at the Lunch Counter/Kahuna Overlook and take the trail to the southwest down to Lunch Counter proper.